As many of you know, in January 2013 I began a project to simplify my life. 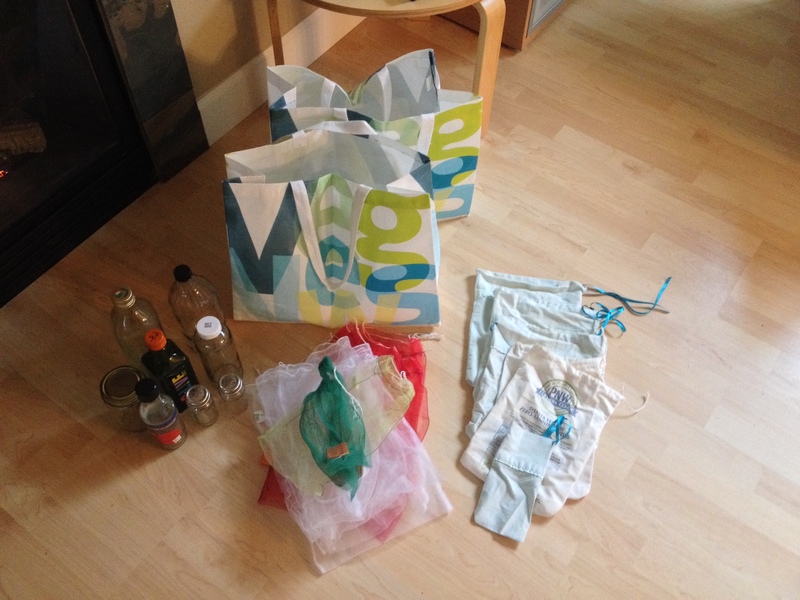 One way I sought to simplify was by reducing my trash and my recycling waste. 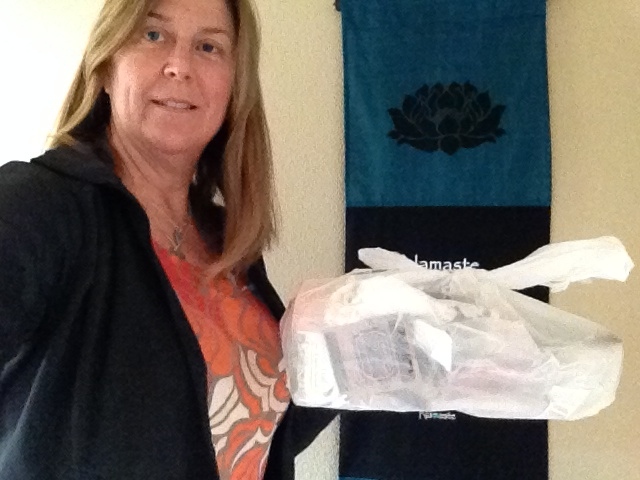 I read Beth Terry’s book “Plastic Free” and it made me aware that there is no magical “away” that our trash goes to. 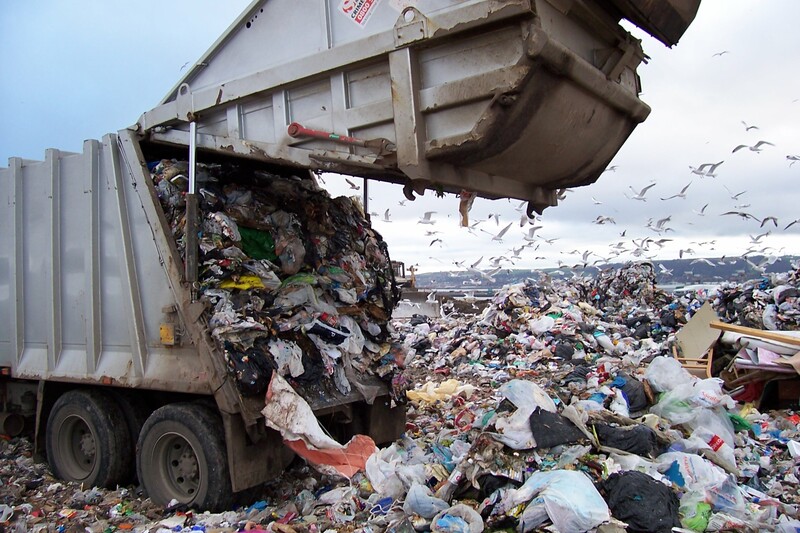 Instead, our trash goes to the landfill where it sets and often contaminates things sometimes for centuries to come. Many items do not decompose, either due to their composition or the environment they are in. 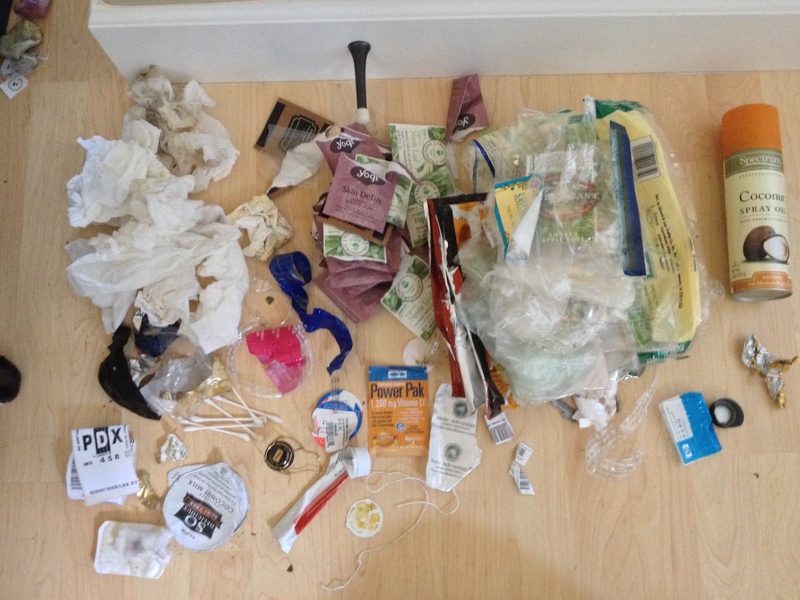 So my passion for reducing my trash grew stronger, but could I make a difference? I know I am only one person, but I believe I have made a difference. I am pleased to announce that what was going to be a months project got extended to the full year and now it is likely my new lifestyle. I now know that making this change is not only easy, but it can be a fun game to find new ways to refuse, reduce and recycle. I believe the Gandhi quote “Be the change you wish to see” is where we all need to start. 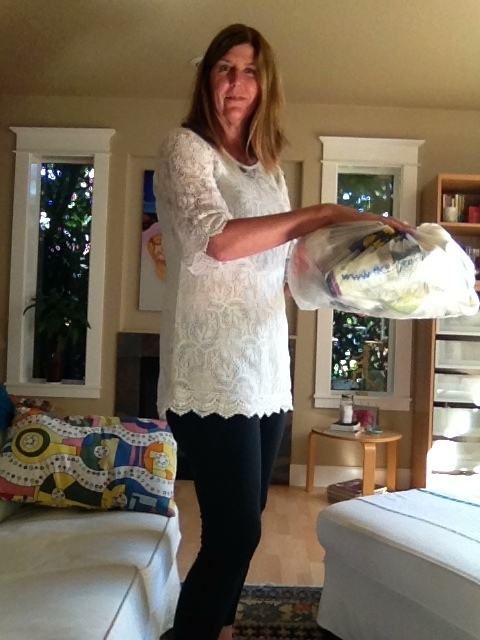 I have consistently had about 1/4 to 1/2 of a regular grocery plastic bag of trash every four weeks versus 2 tall kitchen bags full of trash. I took photos almost every 4 weeks as a way to keep me honest and informed about what was going out to the curb as trash. 4 weeks Trash – August 2013 A bit more due to guests being in my home for 2 months while I was on vacation. 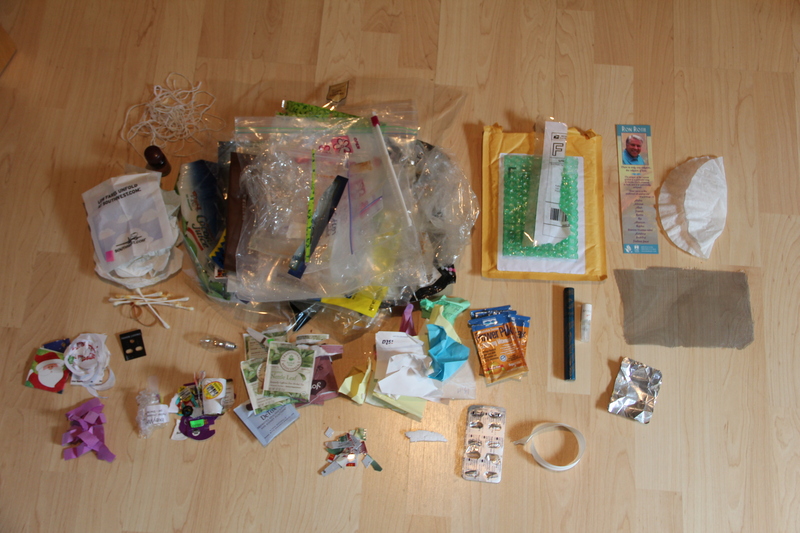 Here is a very typical exploration of what’s in those bags (below). 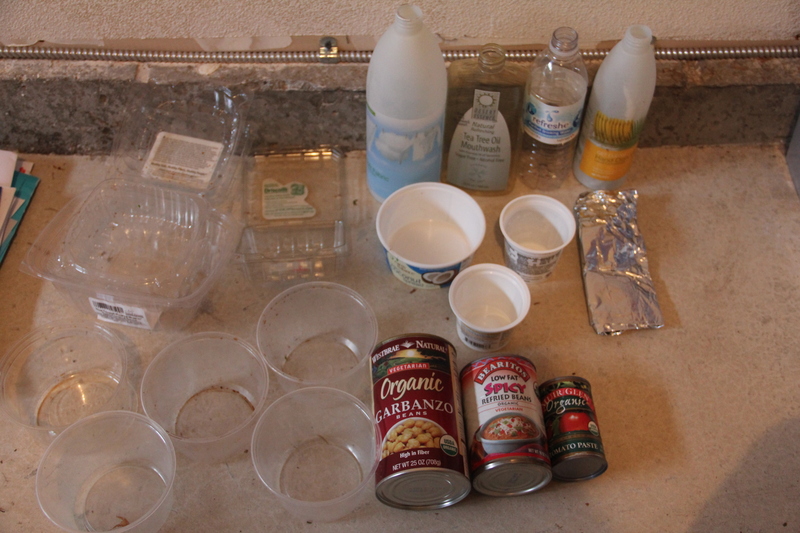 It is mostly plastic that food is packaged in or used to carry food, secure lids, etc. Please note: Each city has different rules for what is recyclable based on the difficulty to separate that item out and the market for it. I also am learning, so some of my photos may contain items such as post-its that I now know are recyclable or tissues that can be composted at your own home. Aerosol cans are recyclable (if they are empty). 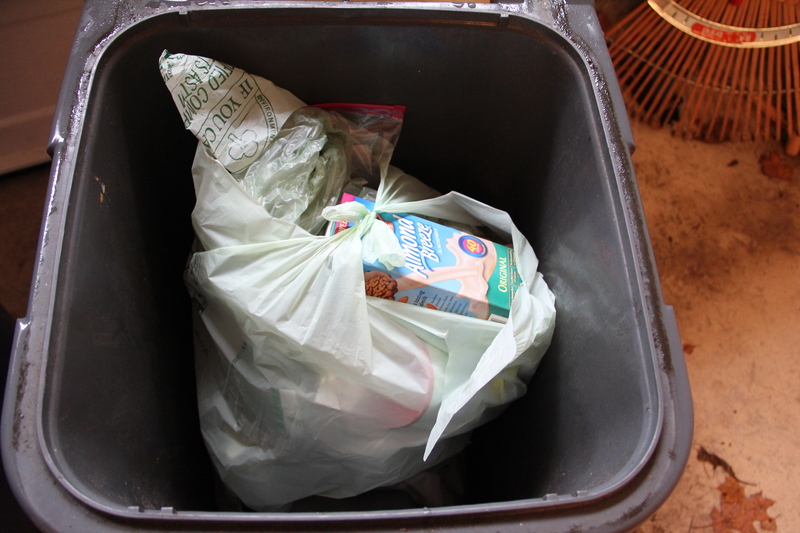 Here is a link to Portland’s recycling, composting and trash guidelines. 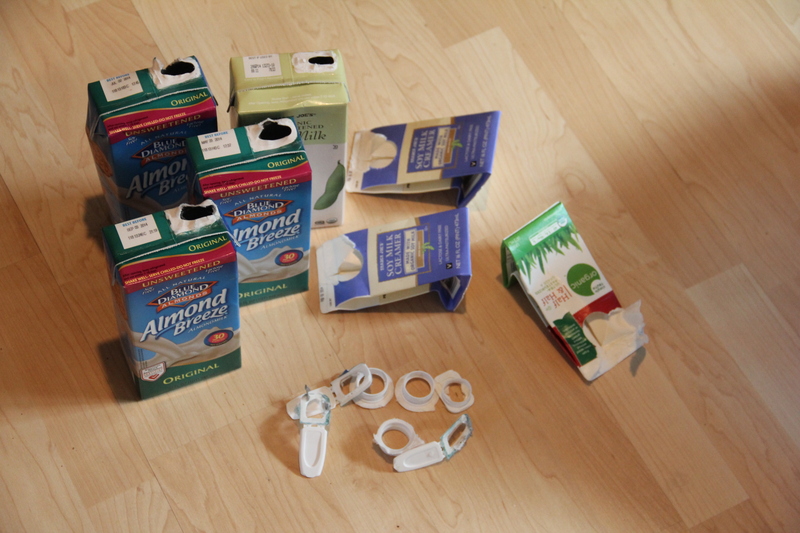 My recycling has consistently been about 1/4 to 1/2 of what it used to be. Let’s start with my January 2013 baseline (below). Some people may be baffled as to why I would want to reduce my recycling, because isn’t recycling good? Yes, recycling is good, but a step up from that is to not waste resources, energy and production costs to make an item in the first place. In the realm of saving our resources we want to refuse, reduce, reuse, then recycle in that order. 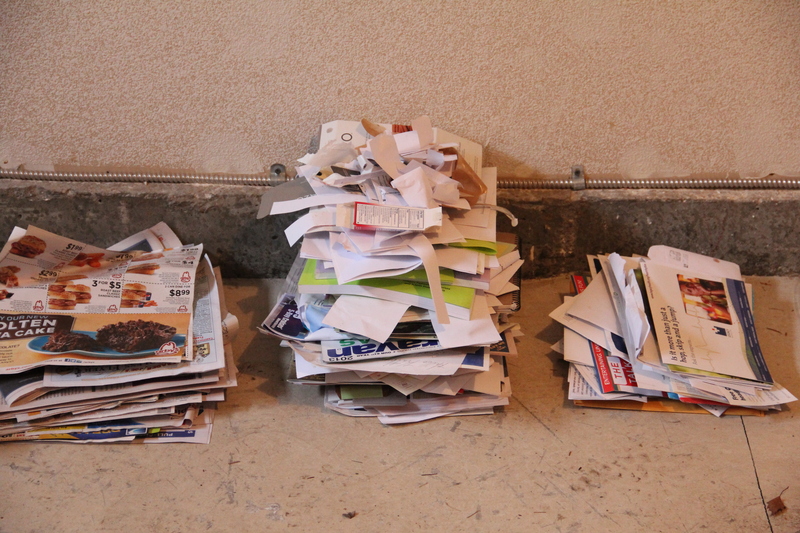 January 2013 – I had about 1/4 of a blue bin full. January 2013 – This is the paper for the 4 weeks. January 2013 – Plastics & metals that can be recycled. January 2013 – Glass items for recycling. 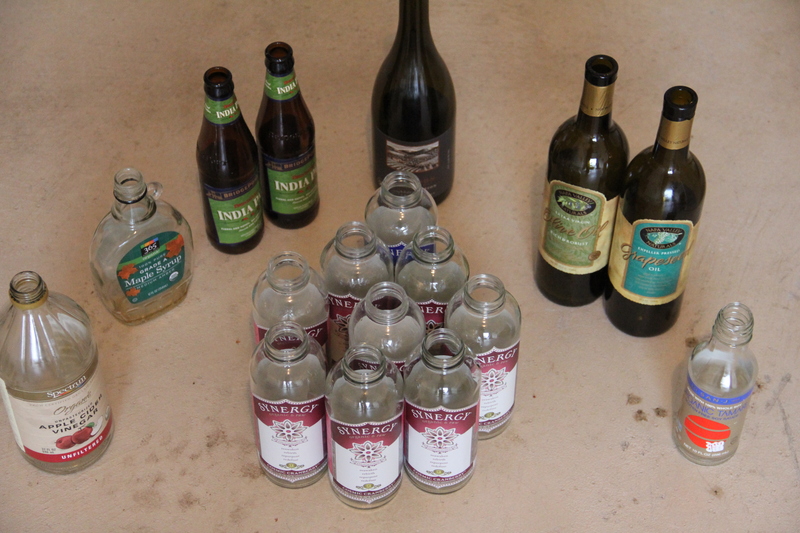 And here is my typical recycling as of December 2013. 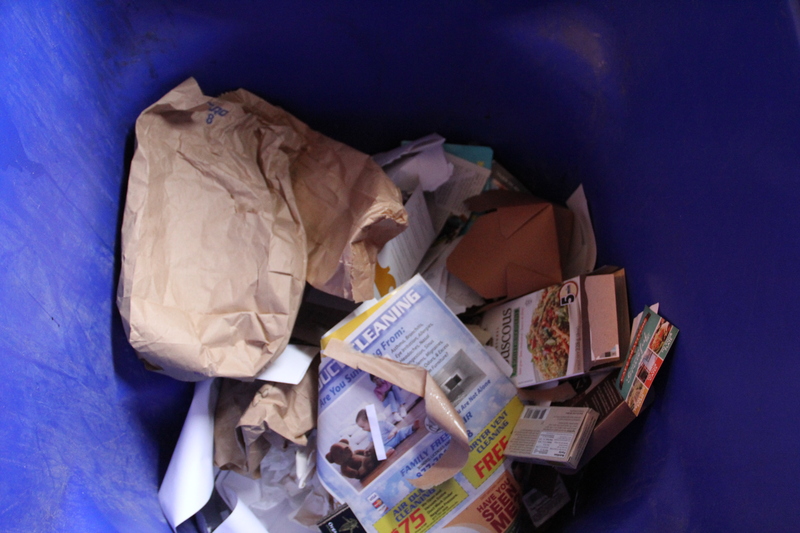 December 2013 – 4 weeks of items for recycling. 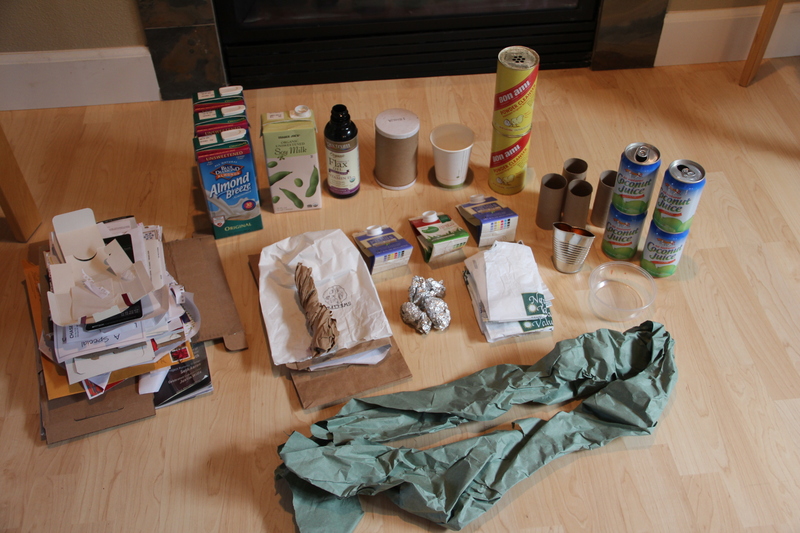 Mostly paper, with some plastic and aseptic containers. In Portland we can recycle aseptic containers. Please remove the plastic lids prior to putting them in your blue bin. 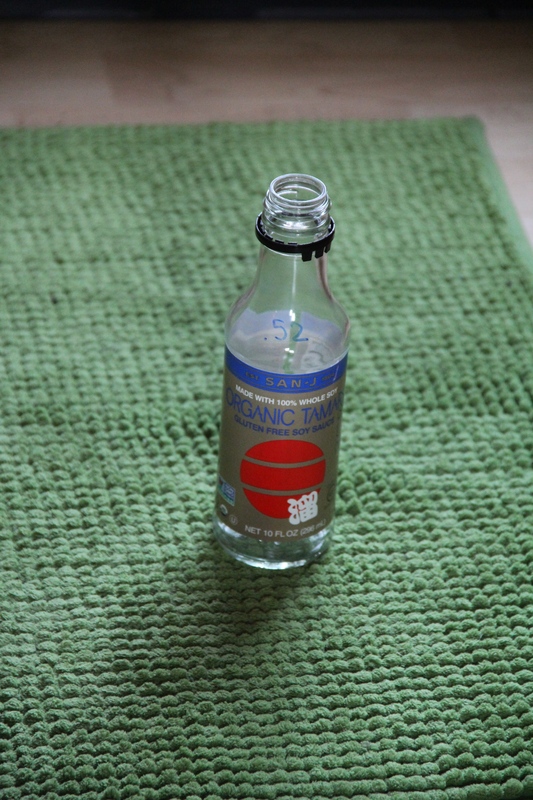 December 2013 – My glass recycling is 1 bottle which has been re-used for getting bulk tamari. Buy from the Bulk Bins. 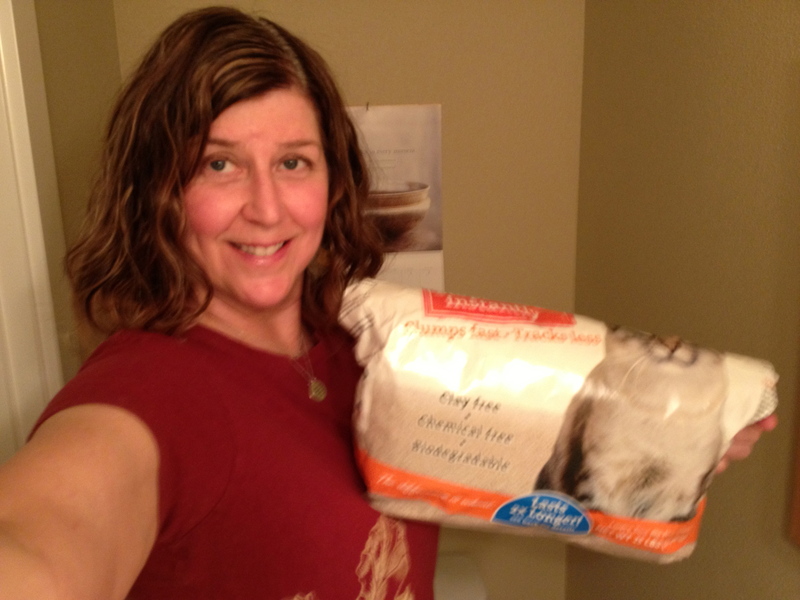 I am happy to be a member of a co-op where I can purchase flour, nuts, grains, teas, herbs, olive oil, apple cider vinegar, tamari and so much more in the bulk foods section. This not only saves on bags, but it also saves on money. I have now made my own cloth bags for purchasing flour, nuts, seeds, etc. 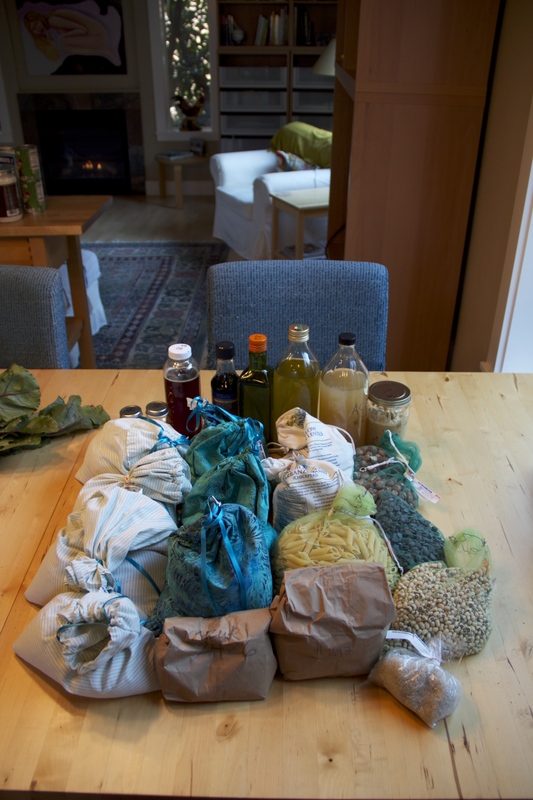 I have jars of various sizes for herbs, oils and liquids. If you ask them to weigh your empty containers and mark them with the tare weight, they can then charge you only for the product you buy (not the container). I also belong to a co-op that has member discount days, so I eat up what’s on hand and then stock up when it is 10-15% off! Don’t put produce in a plastic bag. The first time I did this, it felt wrong to see my produce lying in the basket without a bag. 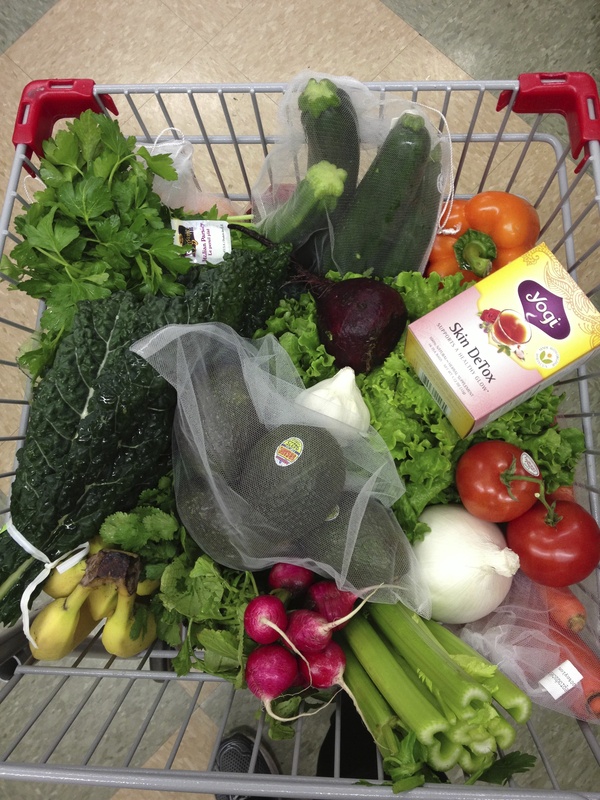 But I buy a lot of produce, so this one step has likely made one of the biggest impacts! I shop at farmers markets when possible or at my co-op. I use mesh bags for apples, lemons and items like this when buying more than one at a time. I presently do still use plastic bags once I get home, but I wash and reuse those bags for storing produce in my refrigerator while looking for better options for keeping produce fresh without plastic. One of the first times I didn’t put my produce into plastic bags while shopping. At first it felt odd, now this feels fine. Carry your water in a reusable container and have it with you within easy reach. Challenge yourself! For each item that comes wrapped in plastic, I see if I can find it somewhere without the plastic. Fun finds have been toilet paper wrapped in tissue paper and an awesome soap from Sappo Hill that is vegan and very cheap as it is made from mill ends. And I now bring my own glass jar to the QVF olive bar instead of using their plastic containers. Consider where you shop. The co-op is so much more plastic-free friendly, as compared with large grocery chain stores, Trader Joe’s or Costco. Get to know what’s best in your area. 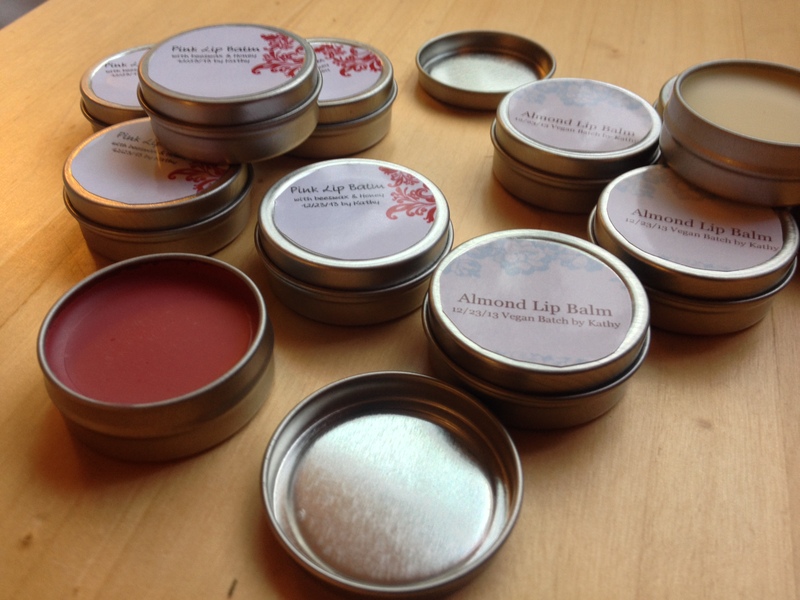 Consider making some items that you previously purchased in plastic such as lip balm, deodorant, toothpowder, yogurt, beans from scratch versus a can, vegan butter, etc. There is an entire world of DIY out there just waiting for you to find it! Use your own trash as your impetuous for what was in plastic that you might consider making yourself. Get educated. Study your disposal companies recycling. Don’t be afraid to call your disposal company to ask questions and find out if something is recyclable. It helps them when we put the right stuff in our recycling bin, so they are happy to help. Did you know that most trash companies can’t take plastic bags? Just one plastic grocery bag can stop the whole separation machine at the recycling plant, so better to be putting the right stuff in the right can. Learn about any secondary recycling programs in your area. 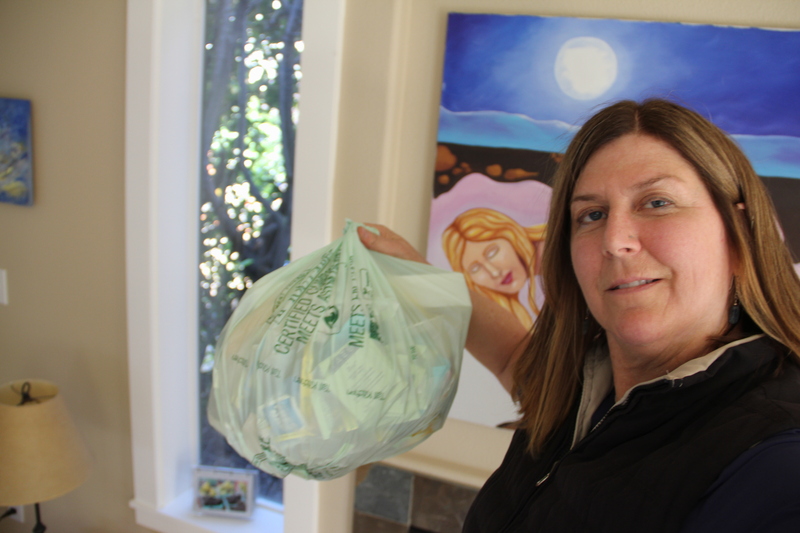 New Seasons will recycle plastic bags. Portland has Far West Fibers which takes many recycling items. Take a class on recycling or going green. 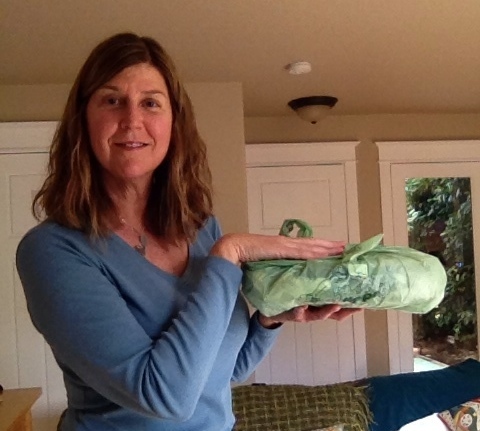 In Portland, Northwest Earth Institute offers classes on sustainability and Betty Shelley at greenhouseone@gmail.com teaches classes on how to reduce waste. Create your own kit. 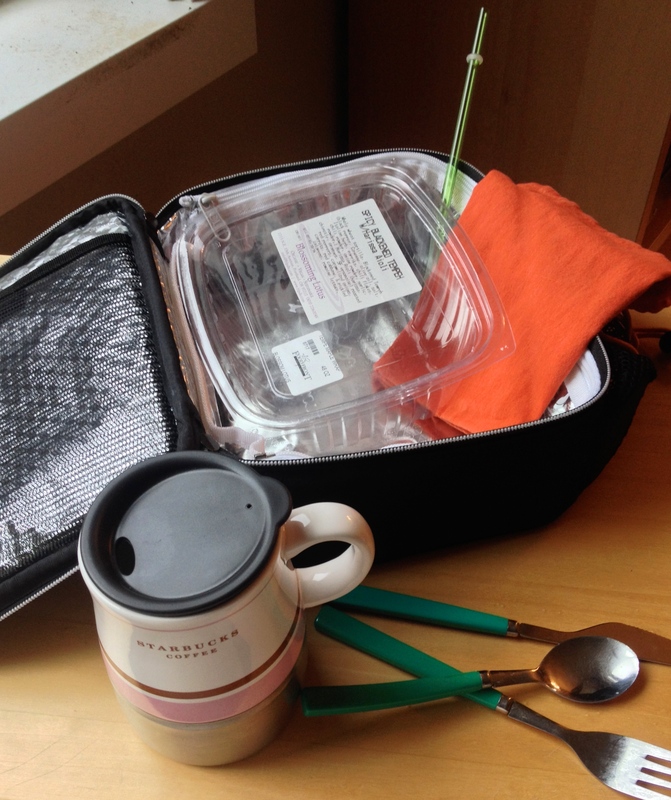 Put a reusable straw, eating utensils, cloth napkin, reusable mug and take away containers in your car or desk at work, so you never are caught without options to avoid plastic. Create your own shopping kit with mesh bags, bulk bags, jars and reusable grocery bags and keep it in your trunk for that next shopping trip! This takes a bit of getting used to, just like that first time you brought your reusable grocery bags into the store. After doing it 3-5 times it feels less awkward and starts to become a habit. With 2013 under my belt, I now need to raise the ante for 2014. In 2014 I plan to switch from trash pick-up every 4 weeks to only when I contact them. My goal is to save up an entire years worth of trash and take a photo with it. 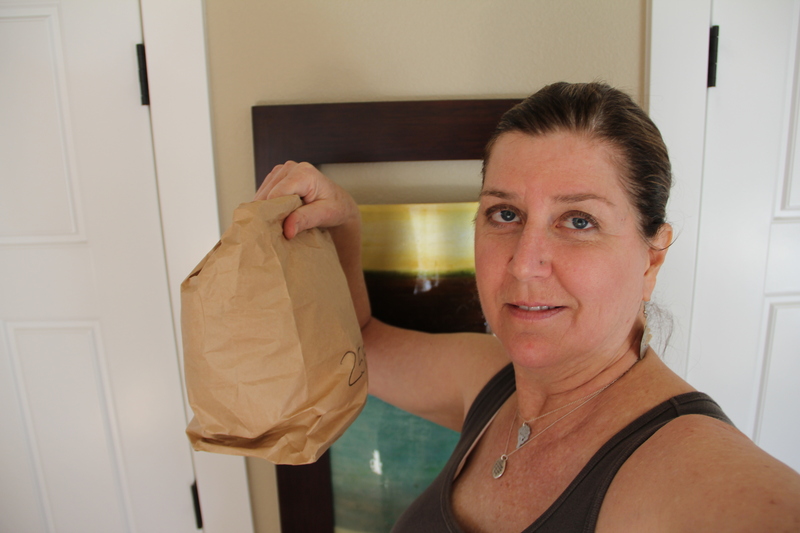 I will stop using “a regular plastic grocery bag” as my measure of trash and start using a paper bag. I will find new ways to waste less food and hopefully find a good alternative to using plastic bags in my refrigerator for produce. I also will stop buying paper towels and to seek ways to reduce my trash and recycling even more! I will be doing future blogs on personal care items and de-cluttering and how these have impacted my 2013 simplification project. This is awesome – so inspirational too. Definitely going to start implementing some of these changes! LOVE IT!!! Tips #6, 7, 8 inspired me for where I am at right now. Thanks for the tip on aseptic containers, as we have been putting them in the trash (didn’t know). You have re-sparked my interest in being a conscious consumer. Glad I stopped by for my once a month FB peek (lol)! Hi Lori, Glad some tips were helpful to you and got your interest re-sparked as well. It is an ongoing learning process, so everyday I learn something new. Here’s to less waste in our lives! Way to go! You have inspired me to take a hard look at what I throw “away.” Thanks for the tips! You are most welcome Taryn. Glad to share my journey and lessons. My city does do a recycling program with the trash pick up. I thought I was doing well to separate my disposable stuff into the right recycle container. It is wonderful that many things do get turned into something else wonderful. If I have some things that are perhaps expired past their date I often take them to work and put them in a plastic bag for our “dumpster divers” to ppick up. This keeps them from being contaminated from the other garbage type things and I think helps them to find a new home.. This works for me right now. Maybe in time I can do better. All recycling is better than trash, so good for you on the steps you have taken. What a great idea to put foods out for others in the way that you do. That is very thoughtful and appreciated I am sure. And it’s never about being perfect. I think it’s all about learning and applying what we learn.